Kandy Nestling amidst low hills, and looped by the Mahaweli river, Sri Lanka's largest, Kandy is still the home of the arts and crafts, music and dance and song which flourished under the patronage of the Kandyan Kings. For Buddhists, Kandy is the sacred city. The focal point is the Dalada Maligawa also known as the Temple of the Tooth, where the Sacred Tooth Relic of Lord Buddha is enshrined. There are many shrines and temples in and around Kandy, where you will see rare paintings, frescoes, wood and stone carvings. The highlight of the year is the Kandy Esala Perahera, when a replica of the relic casket is taken in procession accompanied by exotically costumed drummers, dancers and about 80-100 caparisoned elephants during ten glittering nights in July/ August. 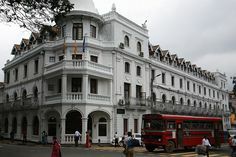 Kandy is an exciting place for shopping with souvenirs of wood, copper, silver, brass and bronze. Ceramics, lacquer work, handlooms, batiks, jewellery, rush and reed-ware too could be purchased. While in Kandy, an outing to a tea factory as well as a tea plantation should also be made to witness first hand, the process that leads to the creation of the famous 'Ceylon Tea'.